Kristin Riley plays a Munchkin in the new blockbuster Oz the Great and Powerful. The 31-one-year old Michigander has a rare condition called primordial dwarfism. Riley is 3 foot five inches tall. Perfect weekend for me to proclaim that without faith, I would never have survived the brutal hits life has served up and I certainly wouldn't be passionate about serving others. My footing is less steady and sure than it once was, but I'm much less naive and less selfish and much more forgiving and quieter, humbling in itself. I believe what I cannot prove and that has made all the difference. Judy Winter Photography 2013. All rights reserved. For me, this is an especially powerful view. I've worked so hard for so long to see this kind of media/celebrity focus/support placed on important human rights awareness for the special needs population and for my son, including the growing push to end use of the word retarded. The big-name support voiced on this video represents huge progress. My hope is you'll add your vote for RESPECT, too. Make no mistake. Words do hurt, especially the r-word. Judy Winter Photography. All rights reserved. In honor of National Cerebral Palsy Awareness Day, my son, Eric Richard Winter. Your music lives on, always. A Tale of True Friendship. Michigan State University Basketball Star, Adreian Payne, and One of His Biggest, Little Fans, Lacey Holsworth. Little Spartan Fan. Judy Winter Image 2013. Here's a side of sports I like and a March Madness story worth your time. It's a moving friendship born of mutual life adversity. Lacey Holsworth had neuroblastoma, a childhood cancer. Michigan State University Basketball star athelete, Adreian Payne, has Attention Deficit Hyperactivity Disorder (ADHD) and has worked hard to overcome the naysayers. As an MSU alum, I couldn't be prouder. I hope both, stay strong. Read more about Adreian Payne, here. Whose life will you impact this week? Jack is rockin his socks for today's World Down Syndrome Day! Then, we're off to school to read to the kids for March is Reading Month. Plus, it's also Cerebral Palsy Awareness Month. March is a busy time for this advocate and the Pooch of the People. But we're up for the challenge, right Jack? Who are you advocating for today? Judy Winter Image. All rights reserved. March 21st! In honor of today's World Down Syndrome Day. Rock those socks! Image courtesy of World Down Syndrome Day. March 21st is World Down Syndrome Awareness Day. First, let me say I like Lady Gaga. I think's she incredibly talented and does a lot of good speaking up for many who otherwise feel they have no voice or can't get it heard. She's not afraid to makes waves and gets people talking. She fights bullying, all of which I like. She celebrates and embraces vast differences. Me, too. Gaga's got tongues a wagging today over her new 24-K Gold wheelchair. 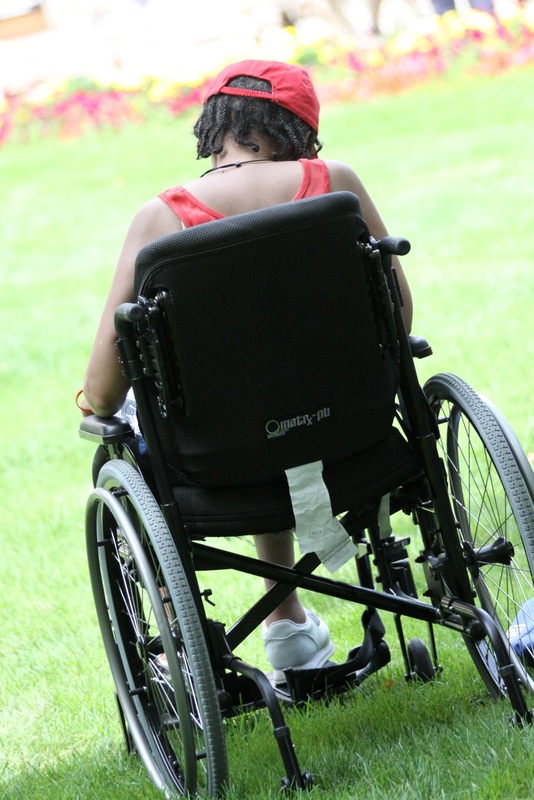 Some have taken her to task for glamorizing disabilities, which doesn't bother me as much as it does some others.Why? Because I think all that talk about Gaga being Gaga, complete with chair choice, glamorous or not, helps create more media awareness and big talk for the special needs cause. That's always good. Might all the ruckus even help normalize wheelchair use a bit? My immediate reaction to this new Gaga story? 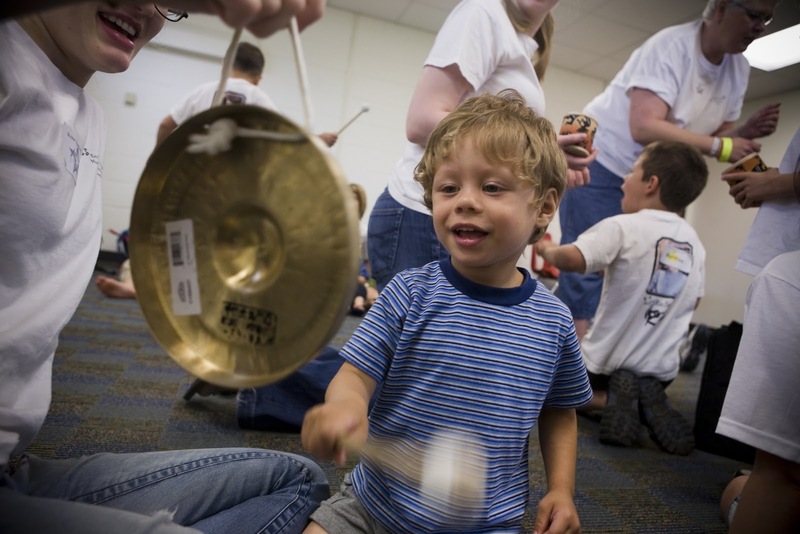 The gold and all those other expensive special needs bells and whistles could have paid for many simpler wheelchairs for regular folks who can't afford one or whose insurance request is denied. That's where I take offense. Perhaps Gaga will consider contributing $$$$ to organizations that help purchase chairs for those in need or perhaps purchase a few herself. That would be Gaga cool. Your reactions, Little Monsters and the rest of the world? Photo above: Reality check. A more common sight? A chariot without all the bling and a ride that's not temporary. Special Needs Casting Call for Toys R Us Annual Catalogue for Diffently-Abled Kids! Ages 12 months to 10 years. Kudos to Toys R Us. 2012 catalogue image courtesy of the retail giant. Emily Rapp. Dragon Moms and Two Grieving Moms. 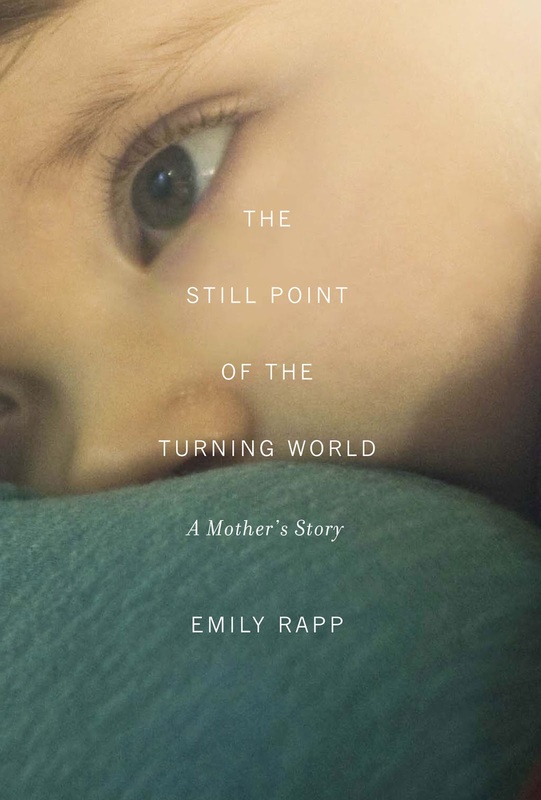 Author/grieving mom, Emily Rapp's powerful piece and interview on this morning's Today Show resonates with me even more than most because I, too, lost my son in cold, cruel February. My loss was ten years ago and one day later. My son lost his life to complications of cerebral palsy. We both shared children with big medical challenges, beautiful, smart, charming, much-loved children fully included in our lives and in the world. We both tried and continue to try to make sense of devastating loss for which no explanation will ever be calming enough. We both chose to help honor our children's lives and help change the lives of others, including by writing and becoming authors about our remarkable and painful journeys. I devoted an entire chapter in my book to facing the death of a child and included a powerful essay about my loss. Rapp details the day-to-day challenges of living with a child she knows is going to die from Tay- Sachs disease, an insidious diagnosis for which there is currently no cure. Any mother and father can benefit from Rapp's wise words, fresh in their grief and from mine, lessons learned from more than a decade in survival mode. We share similar, hard-won advice from parenting battlefields of grief. We share the joy, the lessons and the love of a child that helps turn you into a bit of parenting sage: Enjoy your children. Be fully present. Ease up. Your children are not projects. They are, however, great teachers. But we must open ourselves up and sit still long enough to learn their lessons. I hope you take our parenting advice to heart, especially while your children are still yours to squeeze tightly to your chest. Savor the blessings. It can all be over in the blink of an eye. Special note: A parent never gets over the death of a child. You just learn how to go on breathing moment by moment of each challenging new day, until the horrific stinging finally begins to ease. Finding purpose in sharing your own tough story of loss, while honoring a beautiful child's legacy in the hope it serves others, helps, too. In so doing, somehow, you can survive this loss, even find joy again. Watch the Today Show interview and find link to Rapp's new book, here. An brief, but insightful New York Times Op-Ed piece about the Spread-the-Word campaign. Well said/written, Mr. Downes. Word Gone Wrong. Today is the annual Spread-the-Word-to-End-the-Word campaign, one given birth by Special Olympics and fueled by its talented, hard-working and proud athletes. As a writer, I don't usually endorse censorship. But I don't promote use of (or use) any hate speech either. That's what the word retarded now represents to millions worldwide. Have you ever heard anyone use the word to build someone up? Like other minority speech we loudly denounce and react quickly to, the r-word reinforces painful, outdated and limiting stereotypes. Because of my son, wrongly judged to be intellectually challenged due to wheelchair use and limited motor/speech skills, I know firsthand the daily, painful, tough judgement faced by more than 200 million people worldwide with intellectual disabilities (current, accepted terminology) because of the ignorance and insensitivity fueled by the continued, casual and ugly use of this word as a put down. I choose to show Respect to others instead. What about you? At the very least, I hope you will consider talking with your children about not using the word, especially to put others down. Teachable moment. Make no mistake, words do hurt, especially this one. If you want to read a past post of mine that further details why the r-word can be so hurtful, click here. Photo of RicStar Camp participant by Erik Taylor Photography. All rights reserved. Tuesday's TV Alert! The beauty of the Internet is that if I miss promoting something worthy before it airs, you can still catch it after the fact. 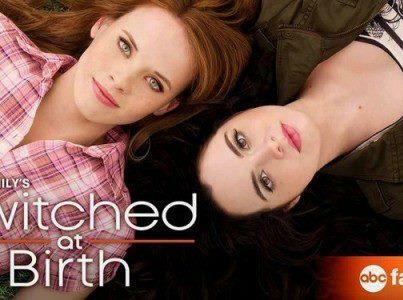 Monday's episode of Switched at Birth is one worth your time. After the first scene, it's all in American Sign Language (ASL). Kudos to all involved in this ground-breaking program/episode. Special offer to Winter Ramblings readers. 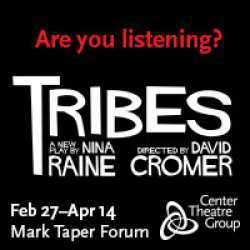 Your chance to see the play TRIBES in Los Angeles at a reduced ticket cost. If you go, please send me photos of your evening to share with the producers. Read on for all the details. Billy is in love. For the first time in his entire life as a deaf person, he has found someone who listens to him. Now Sylvia, on the brink of losing hearing herself, must pass inspection with the family: four dynamically dysfunctional adults living together at home where conversations are filter-free and no topic is taboo except one: why didn’t Billy or his family ever learn sign language? Experience this intimate play like never before at the Taper. Available for this production, a limited number of $20 on stage seats are available. This audience will be “up close” to the action, from the comfort of a theatre seat. With only 6 seats in each row, on stage seating brings the audience closer to the personal touches director David Cromer brought to his off-Broadway production. Click here to see a pdf of the Taper seat map including on stage seating locations. Due to their unique nature, these tickets are not available for late seating, wheelchair accessibility or those who need to leave their seat during the performance. Just $37 (Reg. $50) for select performances in Section A. Valid for evening performances February 27 and 28 and March 3, 5, 6 and 7. To purchase tickets call 213-628-2772 and mention code SILENCE or online here. *Subject to availability. Not valid on previously purchased tickets. May not be combined with any other offers. Offer applies to Section A seating only. Reminder: While I am posting here, most of my special needs daily posts now appear on my professional Facebook page. Here are the links to my current social networking sites. Drum roll, please! Registration for the 11th annual RicStar's Camp is now open to ALL. Go forth and make merry music, but get registered first. Erik Taylor Photography. All rights reserved.